Friday, I had The Day Off again. Technically, I should be Working From Home On Fridays. But, right now, there is little to do Work-Wise and I find myself Stumped with What To Do With Myself. This Friday, I went Food Shopping. I Read part of a book. And then I Took A Nap. Later, after Totally Awesome Husband came home from work, we went out for Dinner at That Tapas Place Down The Block That We Recently Tried. Once again, it was Delicious. In a few months, this Friday To Myself With No Work To Do all goes to Pot, so I better Enjoy It. Ah, Time Off…For Now. Friday Night, I broke down and joined Facebook. My 20 Year High School Reunion is in Two Weeks and I am not going. Because I just took Time Off for My Honeymoon, I can’t ask for More Time Off From Work. And it just doesn’t seem worth it to Fly Back East In A Span Of Two Days just to See People I Haven’t Spoken To In Twenty Years. Plus, I would have to Rent A Car, Find A Hotel, etc. So, I Nixed It. I am kind of Sad that I won't Be There. Thus, I decided to have My Own Reunion on Facebook! I can’t get over How Many Old Friends have reconnected with me over the past 48 Hours. I am talking Pre-school Pals! If you are reading this and want to be My Facebook Friend, go ahead and Ask Me. If you Know How To Do BeFacebookFriend Me, I will BeFacebookFriend you. I just can’t promise I will be Hanging Out there too much. Ah, Face(booking) The Music. Saturday, Totally Awesome Husband and I went to The Bank and opened A Joint Checking Account! I will admit, this was kind of Scary. I mean, we still Pay Our Rent With Separate Checks. But, we had gotten so many Wedding Presents that were Checks Made Out To Mr. And Mrs. Totally Awesome Husband and we had No Where To Deposit Them. This Check-Making Out Thing was particulary annoying because I Did Not Change My Last Name. So, these Checks were only made out to Totally Awesome Husband and were for Him Alone, unless we Opened Up An Account. 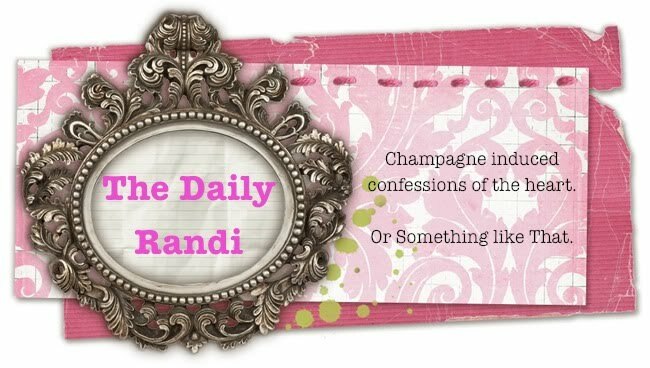 The Bank was Busy, but we managed to Open An Account and now The Daily Randi and Totally Awesome Husband are Officially In Business together! After that, I Worked. Based on My Drama Workshops, I get booked to do Children’s Parties quite often, and this weekend, I had just such An Occasion. The Party was Really Fun. But, I forgot to Take Pictures for my business website and now I am Kicking Myself. When I came home, Totally Awesome Husband was Starving, as was I. So, we went to One Of Our Favorite Italian Restaurants In Santa Monica, No Not That One. This Italian Place is a bit pricier than The One we usually Dine At. But, we had Stayed In All Week, so we figured we could Splurge. It was D for Delicious. And then later, we joined The Slackmistress and Be The Boy for their Post-Vlog Gathering at A Trendy Hollywood Burger Joint for Cocktails. There was A Lot Of Dining Out on Saturday. I swear, I am Counting Weight Watcher Points! Ah, Other People Cooking For You and Drinking All Your Points. Today, Totally Awesome Husband and I slept Late. We need Our Beauty Sleep. I read The Paper. Totally Awesome Husband ran Eleven Miles. And then we went for A Walk and Window Shopped and enjoyed A Glass Of Wine at A Trendy Santa Monica Restaurant. I just realized This Weekend was kind of Boring. But, come on – cut us some Slack here. We just had A Month full of Marital Mayhem and Victorious Vacation. Low Key seems just about right these days. Ah, Sundays.